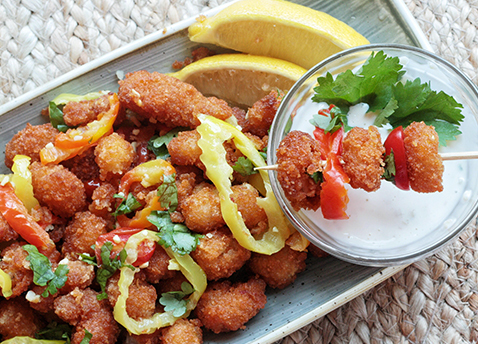 How do you make Popcorn Shrimp really “pop?” Take a cue from Made by Carli and drizzle a little lemon garlic aioli on top! 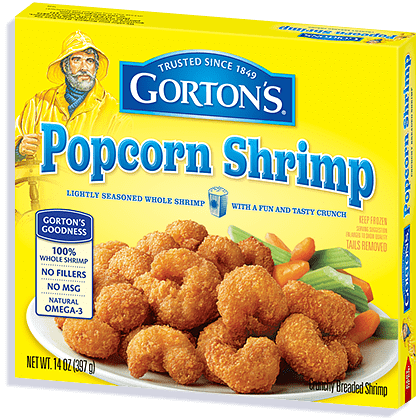 Prepare Gorton’s Popcorn Shrimp according to package directions. I used the frying method to really key into the “fried calamari taste”. Remove Shrimp with a slotted spoon or tongs, and place on paper towels to drain oil. Once drained, place on platter to serve. In a small pan, on medium heat, add butter and saute the minced garlic until lightly browned. Add banana peppers and tomatoes reserving a few for garnish. Toss the peppers and tomatoes in the garlic butter until well coated. Drizzle mixture over Popcorn Shrimp and lightly toss. Sprinkle the shrimp with chopped cilantro and fresh squeezed lemon juice. Aioli: In a small bowl, combine the mayo, garlic, lemon juice and chopped cilantro well until creamy. If desired add chopped capers.